As stated elsewhere in this newsletter, the conference was attended by wonderful people from all over the world. We had hoped to talk with many of them, to get updates on old friends and learn about the work of new acquaintances. However, time constraints and a full schedule limited the number of contacts that could be made. The good news is that we now have names, addresses and e-mail addresses from the participants list and hope to contact many people over the next months to get their experiences for upcoming newsletters. - elementary school GROW BIOINTENSIVE gardening program. - developing an arid GROW BIOINTENSIVE demonstration site in Texas. 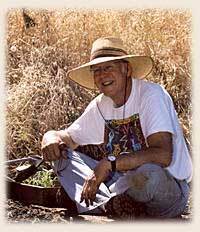 - teaching gardening to children - GROW BIOINTENSIVE teacher certification. - experimenting with crossing Opaque2 corn with Mexican varieties. 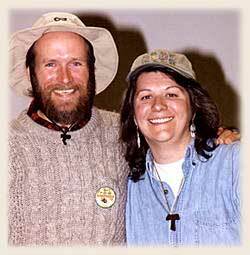 Judy Sims from Santa Barbara attended the Ecology Action Three-Day Workshop held there in 1998. She has been a teacher for over 30 years and is involved in the school's gardening program. At the Sunday evening meeting before the conference she was talking so passionately about the importance of school gardens that other people were encouraged to share their own experiences gardening with children. One of the Conference participants told Delaine Eastin, California Superintendent of Public Education, about Judy's work. Judy is currently a second grade school teacher who teaches her curriculum through GROW BIOINTENSIVE food-raising including a small farmers market and the preparation and cooking of the food grown. Delaine is working on a publication that helps teachers infuse their teaching with concepts related to gardening, nutrition and composting. She visited Judy on April 25 and afterward noted Judy offers a model program of what the State is looking for in a garden-based, nutrition-centered education that is cross-curricular. Newsletter readers may remember this couple, who attended a Three-Day Workshop and have spent some of their summers doing GROW BIOINTENSIVE work in Mexico. Daniel also came to the first Teachers Workshop at Ecology Action. The Vallottons' big news is that they have finally found the land they have been seeking for a long time. It is 610 acres in the Chihuahua desert near Presidio, Texas, just across the Big Bend River from Mexico and bordering on Big Bend State Park. Amber mentioned that Gaspar Mayagoitia is only two hours away, in Chihuahua, Mexico. She said they had been unsure about the type of land they wanted. They are drawn to green areas, but also love the desert. They had even considered getting land in Mexico, but found out it is not legal for foreigners to buy land near the border. When they saw this land, they were sold. Amber had many photos that were taken as they walked the land looking for its corners. In some photos, it was possible to see the mountains of Mexico in the distance. Others showed a substantial temporary creek that runs after a rain. But basically, this is arid land that experiences extremes of wind, heat and quick evaporation. The Vallottons have wanted for a long time to develop an arid GROW BIOINTENSIVE demonstration site. Amber said it will be a challenge to work with the least amount of water and discover the best plants to grow sustainably at the site. They think there is water, but they will also develop catchment basins and will watch the vegetation to figure out the best place to plant their garden. She mentioned the possibility of developing a sustainable drip system, such as one made from bamboo. The biggest challenge they have now is to find funding so that both of them will be able to work full time on the land and really get the project underway. Currently, Amber teaches chemistry and biology at Presidio High School. Daniel is still finishing a project in Mexico under the auspices of New Mexico University. We wrote several articles in the newsletter quite a few years ago about the GROW BIOINTENSIVE project Larkin and his wife Michele were developing in Nayarit, Mexico. At the conference, Larkin was reminiscing about his long-term relationship with Ecology Action. He said he moved to Palo Alto (a city south of San Francisco that was the original site of Ecology Action) as a management consultant and worked for Stanford and then Mt. Zion Hospital. He decided that he did not want to have to work for a year. He spent some time at Common Ground Garden Supply and Educational Center where he played his flute. He played his flute at the Ecology Action's garden as well. Larkin also helped double-dig beds for people in the area and during this time he "got in touch with his real muse." Larkin never went back to consulting, but was able to support himself with his music. He played concerts and gave workshops in 15 countries on 3 continents. The concerts were to help raise environmental consciousness and to promote music more in harmony with its surroundings. Some time later, Larkin and Michele trained for 6 months to prepare them to undertake the Nayarit project. 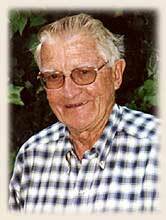 They were there for 3 years, developing a demonstration garden and teaching the method. They sold over 150 copies of the Spanish How To Grow More Vegetables in the little town where they lived. Their next move was to Port Angeles, Washington, where they worked on various gardening projects. Michele passed away a few years ago, but Larkin has carried on with their work. He attended Ecology Action's Teacher Certification Workshop in 1998 and today is teaching gardening to children at an after-school program at the elementary school on Long Beach Peninsula. He will be using this and other experience to fulfill the research requirements to become a certified GROW BIOINTENSIVE teacher at the basic level. At the conference, Larkin opened several of the morning and afternoon sessions by playing his flute. Boone Hallberg has spent most of his life in Mexico, experimenting with crossing Opaque 2 corn with local varieties and has been able to accomplish this with almost 50 varieties from different villages. The resultant corn is high in lysine and tryptophane (amino acids not generally found in corn, which make it a more complete protein) and is highly productive, as well as resistant to pests and disease. Asked at the conference what he has been working on lately, he said he has spent the last 9 years attending international meetings trying to broaden people's minds about alternative types of farming techniques. With Boone was a young man, Francisco Ramos, who is a student at the Instituto Technologico de Oaxaca. Francisco has been surveying local indigenous farmers to find out why they are still using the older, traditional methods of farming rather than adopting the "newer" methods. He said they have told him they are not interested in making money, but rather in maintaining their self-sufficiency and growing food for themselves. The families work together to produce corn as part of their culture. They have been doing this for at least 500 years without using chemicals. Manor House Agricultural Centre in Kenya has recently been experimenting with using some of Boone's Opaque 2 corn as an alternative to the chemical-compatible corn that for many years has been the only type available in Kenya.